Back in 1919, Brooklyn Union Gas moved from the Gowanus Canal to Newtown Creek, creating a 115 square acre Manufactured Gas Plant called the Vandervoort Street Facility, with a farm of cylindrical gas holders. BUG would eventually be purchased by Keyspan Energy, which would itself later be acquired by National Grid. 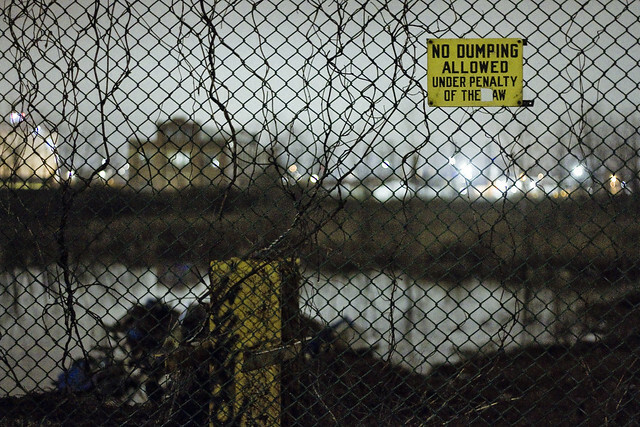 This is where the so called “Maspeth Holders” were imploded in 2001, and the property is generally referred to – in modernity – as the “National Grid Site.” They don’t manufacture gas here anymore, instead they store and process “LNG” or Liquified Natural Gas, which is brought out of its cryogenic status through some arcane technological wizardry for pipeline delivery to the ovens and furnaces of Brooklyn. 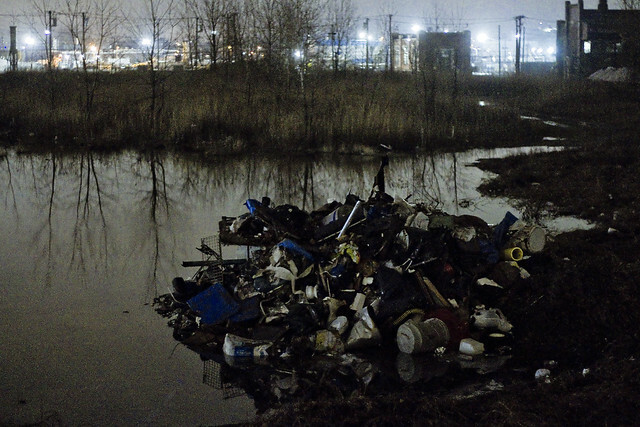 At least a third of their property is relict, and seemingly abandoned. 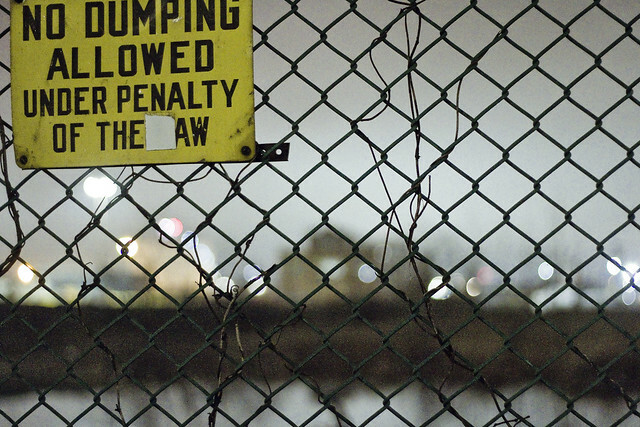 Along the chain link fences of Vandervoort Street, you’ll notice that they’ve allowed a small lake to form in the footprint of some long ago industrial structure. 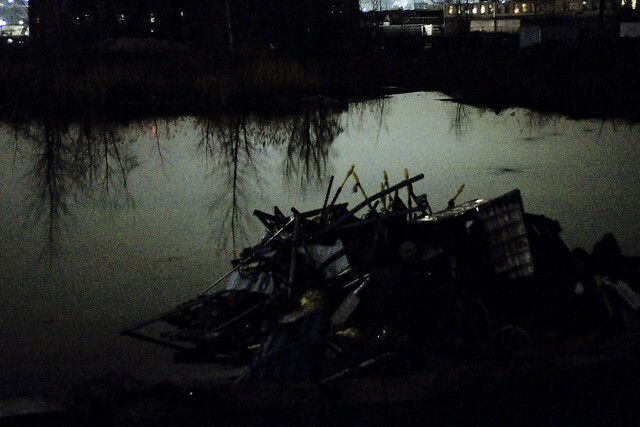 While out the other night on my “night shot” walk, mounds of dumped garbage were noticed around the edges of the small lake on the southern or Vandervoort Street side of the National Grid Site. I guess it’s their property, they can do what they want with it, but personally speaking I try not to poop on my living room carpet. I also try not to poop where a passing photography enthusiast might notice it. There were a couple of these mounds, which looked to be commensurate with what you expect to be able to pack into a medium sized truck. Not sure how long this has been here, as I haven’t wandered past this particular spot in a couple of months. I’ll be sending this post over to the National Grid people and asking what’s going on here. If I get an answer from them which I can share, then you Lords and Ladies will certainly be the first to know it. 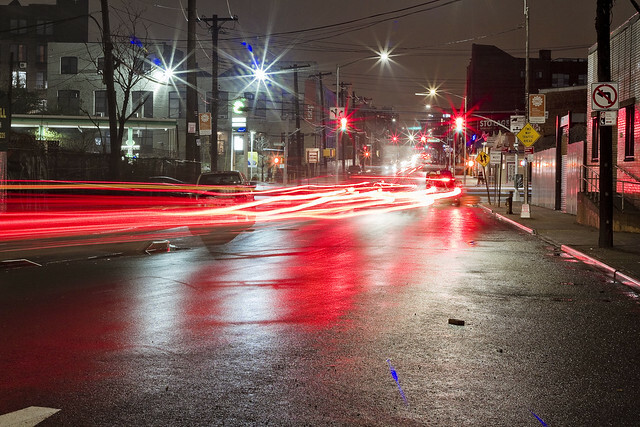 Once I turned onto Metropolitan Avenue, however, I got busy with the cable release and tripod action again.